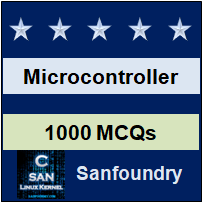 This set of MSP430 Micro-controller Multiple Choice Questions & Answers (MCQs) focuses on “Comparator”. 1. Comparator_A+ is controlled by which of the following peripheral registers? Explanation: Comparator_A+ is controlled by the CACTL1 and the CACTL2 registers. Explanation: CAON bit is used to switch on the comparator module namely, Comparator_A+. Explanation: P2CA4-P2CA0 bits are used for connecting the non inverting inputs to the CA0-CA2 pins. Explanation: CAREFx bits are used for selecting the appropriate reference voltage for the comparator. 5. Which of the following bits are not actually associated with the comparator module? Explanation: CLLDx bit is related to the Timer_2 module. All others are related to the comparator module. Explanation: Flag CAIFG is raised, at the falling or rising edge of the pulse that is selected by the CAIES bit. 7. Setting a bit in the Port Disable register CAPD causes the circuits for the usual digital input and output buffers to be disconnected from the appropriate pin. Explanation: Setting a bit in the Port Disable register CAPD causes the circuits for the usual digital input and output buffers to be disconnected from the appropriate pin. 8. Which bit is used for exchanging the two inputs of the comparator and invert its output to compensate? Explanation: CAEX is used for exchanging the two inputs of the comparator and invert its output to compensate. 9. Changes in Vcc changes the value of V+? Explanation: When some variation is made in the value of Vcc, in the same manner, itself the value of the V+ changes because, the voltage from the potential divider is proportional to Vcc. This changing effect can be reduced if the similar change takes place in the value of V- itself. Explanation: The relaxation oscillator is a circuit that with the help of charging and discharging of an oscillator, help us in calculating the duration of the single RC transient.